Prepare yourself for for a shocking journey into the depths of immortal evil. The living dead have walked among us for centuries. Their feuds firing humanity's bloodiest wars. Now learn the secrets of the most powerful vampires, and the origins of their ancient hatred. 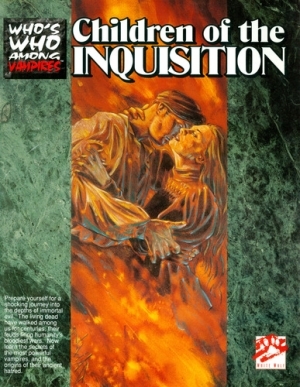 Who's Who Among Vampires: Children of the Inquisition is set in the world of Vampire: the Masquerade. This title was added to our catalog on July 10, 2010.